Encourage the press to cover this story of judicial bribery, judicial incompetence or maliciousness, wholesale violation of civil rights in Cook County Courts, and retaliation against a whistle blower. Come to courtroom 506 2600 S California Ave, Chicago, IL, 10:00 AM on July 20, 2017 and every hearing date after this for case 12 CR 22504, where whistle blower and disabled defendant, Dr. Linda Shelton is on trial, having been illegal charged in violation of the Americans with Disabilities Act for allegedly “touching an officer’s ear and pulling hair” during a PTSD flashback where she cowers, is confused, believes she is being beaten up, and swings her arms around her head to try and protect herself. 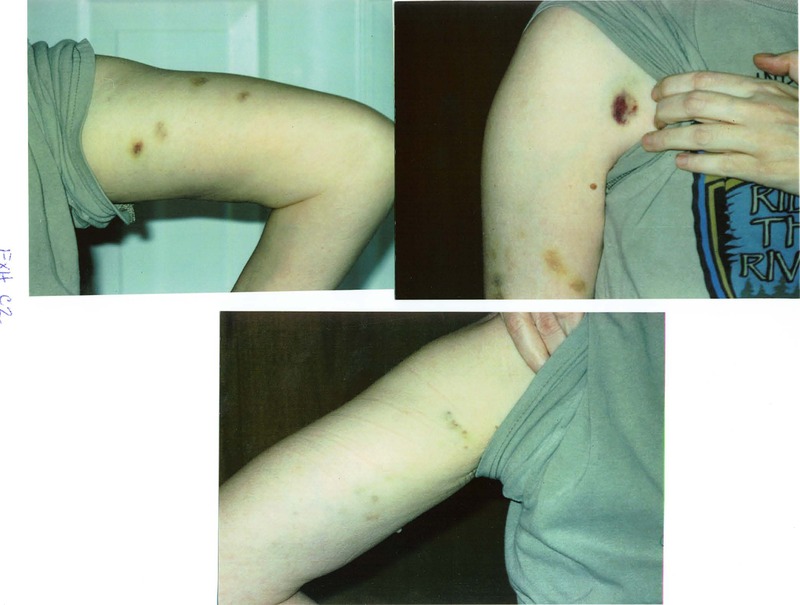 The officers were informed about her flashbacks and to “back-off” as recommended by her psychiatrist during the flashbacks until she “recovers her equilibrium”, but instead grabbed her, literally lifting her off the ground, and then when she touched the officer innocently, likely due to her medical problems including serious lack of balance and the PTSD, Sheriff staff took advantage of the vague and likely unconstitutional Illinois battery statute to charge Shelton with FELONY battery, which could carry a sentence of 3 to 14 years in prison. This is outrageous, immoral, and unconstitutional. A large grass roots effort is needed to challenge this outrage. The following is repeated on Shelton’s Facebook page here. Mass public pressure needed for justice and to fight government corruption and attacks on whistle blower.PLEASE WRITE THE SUGGESTED LETTER TO THE FOLLOWING OFFICIALS! You know that I expose corruption in Illinois and Cook County, particularly family, probate, and criminal courts, through my web sites including: https://cookcountyjudges.wordpress.com, http://chicagofbi.wordpress.com, http://illinoiscorruption.blogspot.com, and http://prosechicago.wordpress.com. There has been a ten year attack against me in retaliation for above and I need public support in a huge way. And ask them to help me to make an appointment with an investigator in the FBI/US Attorney’s offices to file criminal complaints. I need mass involvement in order to obtain justice. My property and home, as well as father’s estate for which I am trustee were all stolen to destroy me and shut me up as whistle blower. I live in Oak Lawn, IL. SUGGESTED LETTER: Please help Linda Shelton to make appointments with the FBI and U. S. Attorney to deal with corrupt judges in Cook County, corrupt peace officers, numerous false arrests in retaliation for her whistle blowing and in violation of the American with Disabilities Act. Her issues cross state lines and expose corruption at the highest political levels in Illinois. She has helped many of us in exposing corruption in the family courts, probate courts, and criminal courts and now she needs our help! She is disabled and her illnesses are making it harder for her to act alone. 2) Theft of her personal property and a $2 million estate for which she is trustee transferred to a person in New Jersey and to unscrupulous attorneys taking advantage of this mentally ill person in New Jersey to convert it to attorney fees. 3) Bribery of a probate judge to write an order saying they own the property and can evict her – when ONLY a forcible entry and detainer action can evict someone – or it is an unlawful lockout, breaking and entering, trespass, wrongful conveyance, theft, etc. The probate judge made orders in the probate case on the issue of a trust – which was not before him so he had no jurisdiction!!! This is criminal action by that judge. 4) False arrest for “touching an officer’s ear” during a PTSD flashback TRIGGERED PURPOSELY BY SHERIFF STAFF – thus a charge of FELONY battery to an officer where they are seeking a 3-14 yr sentence! Shelton is disabled and had a court disability coordinator agreement that the officers would not use info given them to trigger a flashback and if there was a flashback, they would back off while Shelton was confused, cried, cowered and appeared terrified. Instead they grabbed her and carried her to jail, charging her with this fraudulent felony. They are the criminals for violating the agreement. Battery requires intent and they knew there was no intent during a flashback as she was confused and having an altered state of consciousness consistent with a flashback – where she relives in a dream like state attack against her by police where she went into a respiratory arrest. She needs an officer to obtain search warrants and recover her property. Can you ask the FBI and US Attorney to investigate and to assist as it involves a person in New Jersey – thus crime crosses state lines! Shelton has documentary evidence to prove all of the above. Of course, the Oak Lawn police won’t arrest themselves. THANK YOU TO ANYONE WHO WRITES, ATTENDS COURT HEARINGS, OR HELPS ME AND OTHERS FIGHTING COURT CORRUPTION IN ANY WAY! For more details about this story and for the letter and documents sent to the Chief Justice of the Illinois Supreme Court see: http://www.scribd.com/doc/113941439/Illinois-Supreme-Court-Appeal-Disability-Accommodation-Refused-Judge-Peggy-Chiampas-abuses-disabled-defendant This judge should be impeachedas she is committing treason according to the definition of treason by the United States Supreme Court. Dishonorable Judge Peggy Chiampas should be removed from the bench. I have documented in court pleadings before the United States Supreme Court (see links below) how she has refused to transfer a Petition for Writ of Habeas Corpus to the Chief Judge for a Hearing. The right to petition for writ of habeas corpus is the highest right a citizen of the U.S.A. has under the U.S. Constitution (Suspension Clause), so she is violating her oath of office. The petition states and with evidence and quoting law proves that the charges against me (Dr. Linda Shelton) in six pending misdemeanor cases are legally insufficient and therefore Void (a nullity which removes the court’s jurisdiction). It is treason for a judge to hold someone for trial on legally insufficient complainst which don’t state a legal charge. Therefore, she is violating her oath of office and committing treason. This is treason as it is knowing and willing, not a mere error by an ignorant judge. Judge Chiampas has also refused to allow me to attend to my medical needs, thus causing me to collapse in the courtroom, unconscious on March 6, 2012. On March 21, 2012, when the air conditioner broke in the courtroom, before she ascended to the bench, while we were waiting, the room became very hot over 90 degrees. I have medical conditions where I cannot tolerate heat and must remove myself from hot environments or I pass out and go into a cardiac arrest. I told the deputies and the public defender that I was feeling ill and going into the air conditioned hall. Judge Chiampas when she came in the room then ordered my arrest in the hall and refused to allow me to tell her what happened. I was jailed for a week illegally in violation of the Federal Americans with Disabilities Act. This is another violation of her oath of office that requires she be charged with treason and removed as a judge. So far the Illinois Judicial Inquiry Board has been reviewing my complaints about her since July 2012 and have done nothing. Judge Chiampas is REFUSING to accommodate my disabilities and trial is scheduled for November 26, 2012 in room 102 at 10AM at 2600 S California in Chicago, courtroom 102. In retaliation for me not being in the courtroom on March 21, 2012, Judge Chiampas illegally dismissed my pending motions for Substitution of Judge For Cause, for dismissal of charges due to violation of speedy trial Illimois laws and Constitutional speedy trial rights under the Sixth Amndment, for compulsory process to force Court Clerk Dorothy Brown to reveal the addresses (last known and forwarding) of my witnesses, her attorney Phillippa Akem (who has since resigned) and retired Court Clerk Joe Smolensky, as well as REFUSED to transfer my petitions for writs of habeas corpus on pending fraudulent cases to the Presiding First Municipal District Judge E. Kenneth Wright Jr. . Therefore, I am expected to go to court and defend myself againt legally insufficient criminal misdemeanor complainst that fail to state a charge, beyond the deadline for trying me (speedy trial has been violated so the charges must be dismissed), with a biased judge who has actively ignored the constitution, the law, and the Americans with Disabilities Act requirement that she must accommodate disabilities. In addition she has illegally granted the State’s motion to admit into evidence “proof of other bad acts” (pending criminal misdemeanor charges on several other cases that are also legally insuficiient and don’t state a charge, where I am innocent and being retaliated against by corrupt Sheriff staff for filing civil rights cases against their buddies – thus trying me on these cases without a trial, and testimony on a case that was dismissed from a detention aide, Shell, who attacked me in the lock-up, falsified her records and claimed I attacked her). 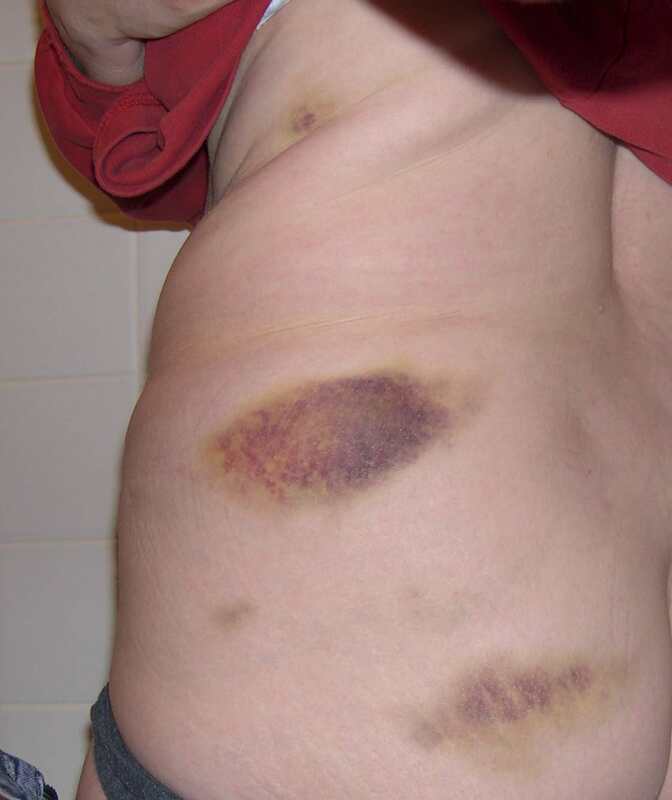 The following are photographs of bruises I received after being viciously beaten by Detention Aide Shell and her colleagues in the female lock-up on March 4, 2006. 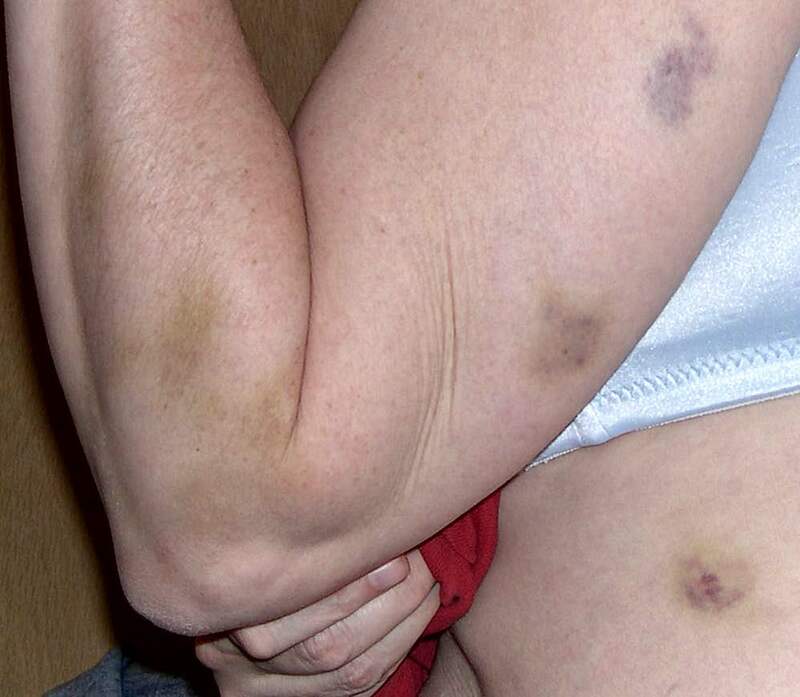 Attack on me by correctional officers Levy, Ruiz, and Connolly who held me down and kicked me with their boots. 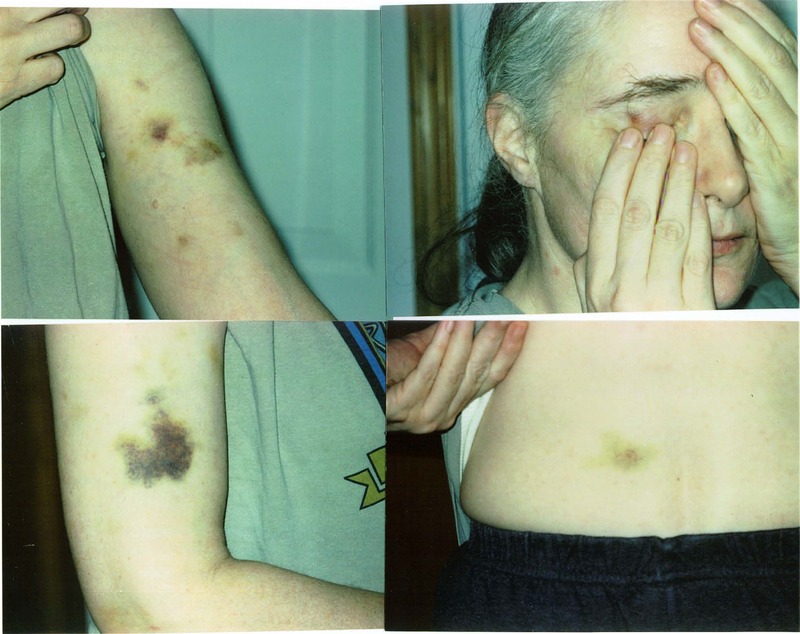 The following is the civil rights suit that was dismissed because I missed the statute of limitations by one day and the photographs of the bruises. They should be arrested for battery of a handicapped person. Sheriff Sheahan and Dart are ignoring the evidence. I have lots of evidence of perjury by the deputies that is being ignored and for excessive force, medical neglect, medical abuse, and battery by Sheriff and deputies. They have killed people and the FBI has not arrested these correctional officers or imprisoned them! This is no different than what the Gestapo did in WWII. We live in a lawless police state in Chicago. Read former IL Senator Roger Keat’s new book “Chicago Confidential” for more details about corruption. Corrupt Judges Jorge Alonso & Kathleen Pantle cause death of innocent defendant Psychological Counselor Vernon Glass. Read about it here.